OPTIMISED ERGONOMICS - The SOPRO 617® intra-oral camera offers a 105° view for improved exploration of the distal areas. 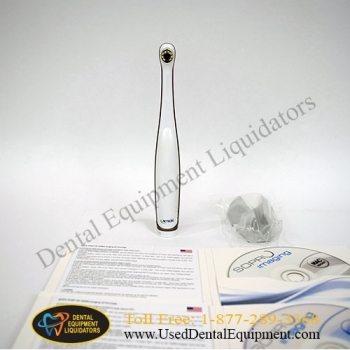 Its rounded shape and the thinness of the distal part make it more comfortable in the mouth. AUTOMATIC FOCUSING AND MAXIMUM DEPTH OF FIELD - The new optical system of the SOPRO 617 is equipped with an aspheric lens which avoids distortion and provides a high quality image. No adjustment is necessary to obtain a perfectly clear image. SOPRO TOUCH, THE “ORIGINAL” - Fix the image on the screen simply by touching the touch-sensitive SOPROTOUCH.